Numbers Used To Identify Something Are Known As? Once upon a time, we relied heavily on horses, but now we rely on cars even more. If you’ve ever stopped to ponder such radical shifts in history, you may have asked yourself, “But…what happened to all the horses?” Some of them were lost in war efforts (right around the rise of the automobile, the United States sent over a million horses to fight in Europe), some were simply sent out to pasture land, but a huge portion of surplus horses in America were turned into the first canned dog food. 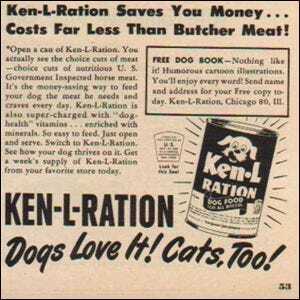 Introduced in 1922 by the Chappel brothers in Rockford, Illinois, Ken-L-Ration (a play on the well-known K-rations issued by the military) was primarily horse meat, along with some vitamins and filler. While the business started as a means to dispose of horses no longer needed for commerce or military purposes, the canned dog food business proved so successful that within a decade, the brothers were raising and slaughtering 50,000 horses a year for the sole purpose of creating more dog food. The business continued to be so successful, the Chappels sold it for a tidy sum to Quaker Oats. Eventually, and perhaps somewhat ironically, the gears of war turned again and put an end to the horse-meat-as-canned-dog-food business. Just as World War I had ushered in the obsolescence of the horse and kicked off the horse-meat business, World War II’s tin and meat rationing put an end to canned dog meat (and in turn gave rise to the dry kibble industry). Image courtesy of Quaker Oats.